Araya, T., Bohner, A. and Wirén, N. v. (2015). 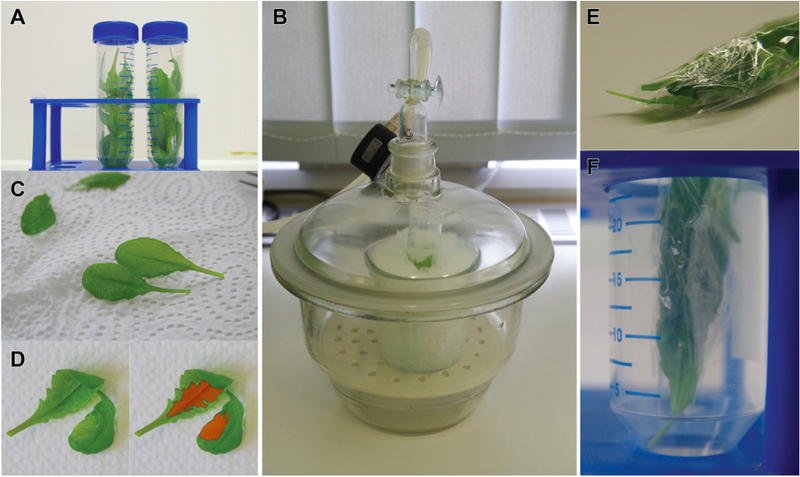 Extraction of Apoplastic Wash Fluids and Leaf Petiole Exudates from Leaves of Arabidopsis thaliana. Bio-protocol 5(24): e1691. DOI: 10.21769/BioProtoc.1691. The long-distance translocation of metabolites and mineral elements is crucial for plant growth and reproduction. In most cases, source-to-sink translocation of metabolites and minerals requires their passage through the apoplast, irrespective whether they are transported via the xylem or the phloem. This apoplast-mediated pathway is of particular importance during plant senescence, when photoassimilates as well as organic, inorganic or chelated forms of nutrients are translocated from leaves to fruits or seeds. Recent genetic and physiological studies revealed the involvement of numerous membrane transporters mediating phloem loading of amino acids, sugars, urea or mineral elements. To evaluate the contribution of individual transporters to xylem unloading or phloem loading, the collection of apoplastic fluids and of phloem sap is essential. Here, we describe a method for the extraction of apoplastic fluids and the collection of leaf petiole exudates from Arabidopsis leaves, the latter representing an approximation to the real composition of the phloem sap. Note: Healthy leaves should be used, preferentially from hydroponic or soil culture. At least 4 g of fresh leaves, corresponding to approx. 60-70 leaves with an average blade length of 3-4 cm, are collected from intact Arabidopsis plants. Notably, these leaves should be intact. While very young leaves have smaller intercellular space yielding less apoplastic fluid, old leaves may contaminate the apoplastic fluid with cytosolic constituents whenever membrane integrity decreases; thus fully expanded leaves are ideal. Leaves are divided into 3 technical replicates of approx. 1.3 g each and transferred to 50 ml Falcon tubes before weighing and recording fresh biomass per sample. Each sample is then washed with approx. 40 ml ice-cold autoclaved distilled water for two or three times (Figure 1A). Wet leaves of one sample are incubated in an open Falcon tube filled with 40 ml of ice-cold distilled water and placed into a vacuum desiccator. The intercellular space of the leaves is then infiltrated with water by applying a vacuum of -80 hPa five times for 2 min each time using a vacuum pump (Figure 1B). To facilitate the removal of air bubbles from the leaves, tubes are gently shaken after the vacuum has been released. In the desiccator, tubes are kept on ice to decrease the risk of intracellular components leaching to the apoplastic fluid e.g., whenever the plasma membrane of leaf cells is damaged or may have become leaky. All water is removed from the tube, and the leaf tissues are wiped dry with paper towels (Figure 1C). Successfully infiltrated parts of the leaves usually become transparent (Figure 1D). If large parts of the leaf areas are found not to be infiltrated, vacuum infiltration is performed again to fill also the remaining intercellular space with water. Finally, all water droplets on the surface of the leaves are carefully removed. The leaves are transferred to a fresh 50 ml Falcon tube, and the tube is centrifuged at 100 x g and 4 °C for 20 min. To better separate the leaves from the apoplastic wash fluid, leaves can be rolled in saran wrap in a way that the roll is opened towards the bottom, allowing the apoplastic fluid to drain out during centrifugation (Figure 1E-F). Leaves are removed from the tube, and the collected apoplastic wash fluid is transferred to a fresh and preweighed 1.5 ml tube. The volume of the fluid is then measured by weighing. In general, 10-50 μl of apoplastic fluid can be collected by centrifugation. To test for possible intracellular contaminants in the apoplastic wash fluid, the activity of cellular marker enzymes like malate dehydrogenase or hexosephosphate isomerase can be measured within the fluid (Lohaus et al., 2001). The collected apoplastic wash fluid is then ready for the analysis of mineral elements by ICP-MS (Eggert and von Wirén, 2013) or amino acids and other compounds (Bohner et al., 2015). The apoplastic fluid can be stored at -20 °C for several weeks, depending on the stability of target compounds. Figure 1. Extraction of leaf apoplastic wash fluid. A. Collection of fresh leaf material. B. Incubation of immersed leaf samples under vacuum pressure. C. Leaves are wiped dry to remove water and droplets from the leaf surface. D. Successfully infiltrated leaves become transparent. Left image shows leaves after infiltration, while in the right image the infiltrated leaf tissue is marked in red. E. Leaves after being wrapped in Saran. The Saran wrap is not closed at the bottom to allow apoplastic fluid passing through. F. Placement of Saran-wrapped leaves in a centrifuge tube. Intact leaves are detached from plants close to their base (Figure 2A) and weighed for fresh weight determination. Plants may be cultivated on soil or in hydroponics under controlled conditions. However, any growth condition is fine as long as healthy, intact and physiologically active leaves are given. These leaves are immersed in EDTA solution, and the base of their petioles is cut again to avoid embolism (Figure 2B). Droplets on the leaf surface are removed by paper towel. Petioles of 2-3 leaves are rapidly transferred to a 2.0 ml tube filled with 1.8 ml EDTA solution. If the petioles are short, the volume of the EDTA solution can be increased to 1.9 ml (Figure 2C). EDTA is used as exudate collection medium since it chelates calcium and thereby prevents re-sealing of sieve tubes (King and Zeevaart, 1974). Since the chelating activity of EDTA ceases at acidic conditions, the pH of the EDTA solution is adjusted to 8.5 with 5 M KOH. These leaves are kept for 6 h in a glass container in a growth chamber e.g., at 22°C and 80-90% humidity and a light intensity of 200-280 μmol m-2 s-1 to ensure ongoing leaf photosynthesis. High humidity is required to suppress leaf transpiration and uptake of EDTA solution through the leaf petiole. In general, the rate of exudation from leaf petioles is maintained for a period of 1-4 h and reaches a plateau after 6 h (King and Zeevaart, 1974). The leaves are removed, and the leaf petiole exudates are eventually concentrated using a vacuum concentrator or speed vac at 4 °C before re-suspension in a smaller volume of water, methanol or any other type of solvent depending on the subsequent analysis. For any type of metabolite analysis exudates should be stored at ≤ -20 °C. After the collection of leaf exudates, the leaves are dried in the oven at 55 °C until constant weight, and the dry weight of the leaf tissue can be determined by weighing. Leaf petiole exudation can be related either to fresh or dry weight basis. Figure 2. Collection of leaf petiole exudates. A. Leaves are detached from plants at the base of the leaf petiole. B. The leaf petiole is cut again when the petiole is immersed in 10 mM EDTA. C. Petioles of 2-3 leaves are immersed to 10 mM EDTA in a 2 ml tube and kept under light condition for 6 h.
This protocol was adapted from previously published studies by King and Zeevaart (1974), Corbesier et al. (2001), Lohaus et al. (2001), Kojima et al. (2007) and Carvalhais et al. (2011), and was performed by Bohner et al. (2015). This work was financially supported by Deutsche Forschungsgemeinschaft DFG Research Unit FOR948 (W1728/14). We also thank Lisa Unrath for excellent technical assistance. Bohner, A., Kojima, S., Hajirezaei, M., Melzer, M. and von Wirén, N. (2015). Urea retranslocation from senescing Arabidopsis leaves is promoted by DUR3-mediated urea retrieval from leaf apoplast. Plant J 81: 377-387. Carvalhais, L. C., Dennis, P. G., Fedoseyenko, D., Hajirezaei, M. R., Borriss, R. and von Wirén, N. (2013). Root exudation of sugars, amino acids, and organic acids by maize as affected by nitrogen, phosphorus, potassium, and iron deficiency. J Plant Nutr Soil Sci 176: 3-11. Corbesier, L., Havelange, A., Lejeune, P., Bernier, G. and Périlleux, C. (2001). N content of phloem and xylem exudates during the transition to flowering in Sinapis alba and Arabidopsis thaliana. Plant Cell Environ 24: 367-375. King, R. W. and Zeevaart, J. A. (1974). Enhancement of phloem exudation from cut petioles by chelating agents. Plant Physiol 53: 96-103. Kojima, S., Bohner, A., Gassert, B., Yuan, L. and von Wirén, N. (2007). AtDUR3 represents the major transporter for high-affinity urea transport across the plasma membrane of nitrogen-deficient Arabidopsis roots. Plant J 52: 30-40. Lohaus, G., Pennewiss, K., Sattelmacher, B., Hussmann, M. and Muehling, K.H. (2001). Is the infiltration-centrifugation technique appropriate for the isolation of apoplastic fluid? A critical evaluation with different plant species. Physiol Plant 111(4): 457-465. How to cite: Araya, T., Bohner, A. and Wirén, N. v. (2015). Extraction of Apoplastic Wash Fluids and Leaf Petiole Exudates from Leaves of Arabidopsis thaliana. Bio-protocol 5(24): e1691. DOI: 10.21769/BioProtoc.1691.